The next five years will see an interesting change in the Aylesbury property market. My recent research has concluded that the rent private tenants pay in Aylesbury will rise faster than Aylesbury property prices over the next five years, creating further issues to Aylesbury’s growing multitude of renters. In fact, my examination of statistics forecasts that ..
By 2022, Aylesbury rents will increase by 23%, whereas Aylesbury property values will only grow by 16%. Over the last five years, property values in Aylesbury have risen by 48.7%, whilst rents have only risen by 16.3%. 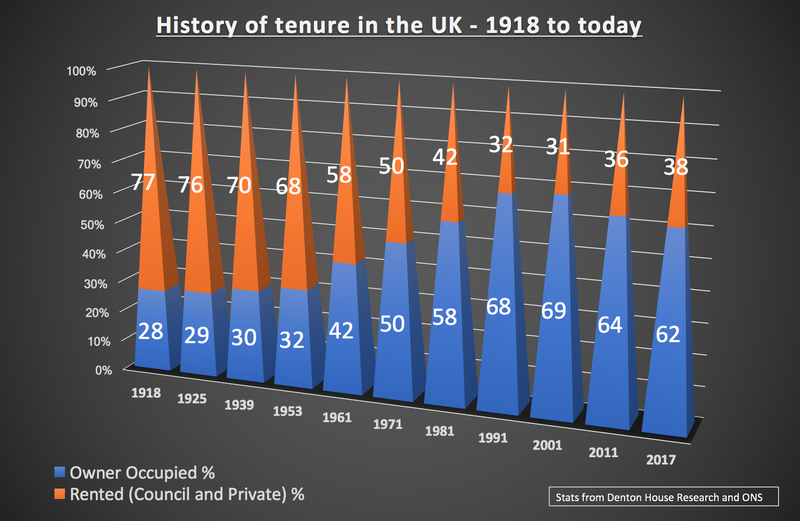 Throughout the last few years, and compounded in 2016, tenant demand for rental properties continued to go up whilst the Press predicted some landlords expect to reduce their portfolios in the next couple of years, meaning Aylesbury tenants will have fewer properties to choose from, which will push rents higher. In fact, talking to fellow property professionals in Aylesbury, there appears to be privation and shortage of new rental properties coming on to the Aylesbury lettings market. All I would say to Theresa May and Philip Hammond is that they must be wary about indicating both red and green lights at the same time to the private rented sector. They can’t expect the armies of small private landlords to continue to house around a fifth of the population and then tax the hell out of them. 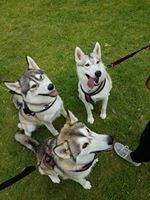 They didn’t invest in buy to let as a charity or to satisfy any philanthropic urges. Something has to give – and that will be significant rent rises over the coming few years (and before anyone gives me any derogatory comments about landlords … if it wasn’t for landlords buying all these buy to let properties over the last 15 years, I am not sure where everyone would be living today – because most of the Council houses were sold off in the 1980’s!). With the challenges ahead, with the ‘B’ word (that’s budget if you wondered! ), house price inflation will be tempered over the coming five years in Aylesbury. As I have discussed in previous articles, the number of properties on the market in Aylesbury remains close to historic lows, which is both good as it keeps house prices relatively stable, yet not so good as it impedes choice for buyers… and hence why I believe property values in Aylesbury will only be 16% higher in five years’ time. These are interesting times. There is still money to be made with buy to let in Aylesbury – Aylesbury landlords will just need to be smarter and more savvy with their investments. As the end of the first quarter approaches it is a great time to take stock of what is going on in the property market. The New Year enthusiasm has died down a bit, optimistic agents, sellers and landlords alike have become a bit more realistic as the market finds its own level. It is interesting to look at some facts. The lettings stock available in Aylesbury has increased and continues to do so from 116 properties in January to 156 today. This illustrates that you as a landlord have more competition currently. You need to make sure your price is right and present the property to a high standard to ensure you let swiftly. The number of lets in Aylesbury was just 62 in February, fewer in any one month than I can recall for years. New to the market tenants are reluctant to enter the market when high prices prevail. Fortunately March has been much better but some landlords have found themselves forced to reduce rents to attract tenants. The supply of new stock coming to market is only slightly lower than last year. This surprised me as we were seeing many investors buying and then letting prior to the Stamp Duty changes in 2016. The sales market has been indifferent in January and February but that is entirely in line with previous years. We have seen lots and lots of activity that does not convert to results until you reach March. This month has seen our sales double the previous two months and even more surprisingly double the level of sales we agreed in March 2016! So there is no sign that prices are about to fall back. Of course they have to be realistic to start with. You are seeing many price reductions in the market but don’t be fooled in to thinking this is a sign that the market is falling. It is not. This is merely over ambitious agents working to bring their overpriced stock in line with the market, where it should have been to start with! I think many investors, buy to let landlords were waiting to see if the market would fall back from its high levels as the year progressed, but there is little sign of that. In summary…if you were waiting for the market to take a tumble before buying to let it does not look like that is about to happen. Buy now before the good stock has disappeared. If you are trying to let, getting your price and presentation spot on is vital to attract tenants. As always do your own research and make sure you are buying the right property to suit your investment goals. The figures used above have been generated via Rightmove using various filters in the search for data. These filters or lack of them will generate different results dependent upon the filters used. An Aylesbury homeowner emailed me last week, following my article posted in the Aylesbury Property Blog about the change in attitude to renting by the youngsters of Aylesbury and how they thought it was too expensive for first time buyers to buy in Aylesbury. There can be no doubt that buy to let landlords have played their part in driving up property values in Aylesbury (and the UK) and from that made housing a lot less affordable for the 20 and 30 something's of Aylesbury. They asked if the Bank of England (BoE) should be tasked to control house price inflation in the same way as the BoE controls inflation. The BoE has a target for the annual inflation rate of the Consumer Prices Index of 2%, whilst it is also required to support the Government’s economic policy, including its objectives for growth and employment. So, should BoE be charged with containing buy to let housing market, by possibly changing the rules on the loan-to-value (LTV) ratio’s? So, let’s look at how affordable Aylesbury is? 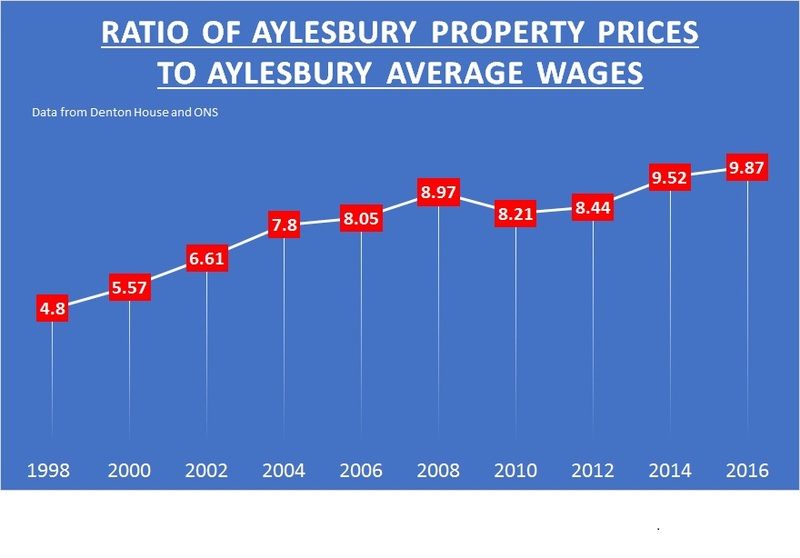 The best measure of the affordability of housing is the ratio of Aylesbury Property Prices to Aylesbury Average Wages, (the higher the ratio, the less affordable properties are). (i.e. 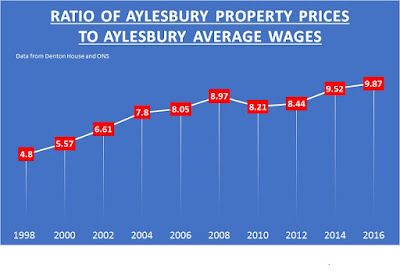 looking at the table below, for example in 2014, the average value of an Aylesbury property was 9.52 times higher than the average annual wage in Aylesbury). This deterioration in affordability of property in Aylesbury over the last couple of years has been one of the reasons why the younger generation is deciding more and more to rent instead of buy their own house. A quick look on Money Supermarket today found 169 lenders prepared to offer 75% LTV Buy to let Mortgages and none at 85% LTV. Lenders have imposed a high level of entry for buy to let landlords (i.e. putting down at least 25% of the purchase price in cash). The BoE don’t need to meddle there! Also, the Tories have certainly done lots to level the playing field in favour of first time buyers. For nearly a year now, Landlords have had to pay an additional 3% in stamp duty on any buy to let purchase and over the coming four years, tax rules on landlord’s claiming mortgage interest relief will affect their pocket. Neither, it doesn’t help that the local Authority sold off council houses in the Thatcher years and so for many on low incomes or with little capital, owning a home has simply never been an option (today or in the past). It’s easy to look at the headlines and blame landlords. First time buyers have been able to access 95% LTV mortgages since 2010, meaning even today, a first-time buyer could purchase a 2 bed apartment in Aylesbury for around £190,000 and only need to find £9,500 deposit. Yes, a lot of money, but first time buyers need to decide what is important to them. I think we as a Country have changed ... renting is returning to be the norm. 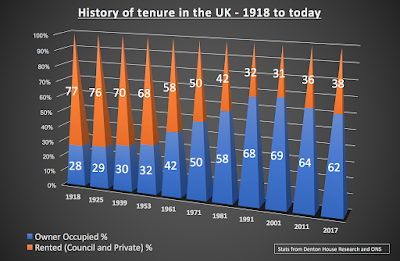 Let’s not blame landlords for the ‘perceived’ woes of the nation ... because to be frank … we haven’t always been a country of homeowners. Roll the clock back to 1964, and nationally, 30% of people rented their home from a private landlord – today – its only 15.3% nationally. Is your purchase as tax efficient as possible? Are there ways you can reduce your capital gains tax exposure? Inheritance tax? What do you buy in Aylesbury to gain greatest capital growth potential? To talk through your property investment plans, what to buy and where to buy it get in touch ian@mortimersaylesbury.co.uk ….my advice is free. Investing in Aylesbury buy to let property is different from investing in the stock market or depositing your hard-earned cash in the Building Society. When you invest your money in the Building Society, this is considered by many as the safe option but the returns you can achieve are awfully low (the best 2-year bond rate from Nationwide is a whopping 0.75% a year!). Another investment is the Stock Market, which can give good returns. Most people invest in stock market funds, making the investment quite hands off and one always has the feeling of not being in control. However, with buy to let, things can be more hands on. One of the things many landlords like is the tactile nature of property - the fact that you can touch the bricks and mortar. It is this factor that attracts many of Aylesbury’s landlords – they are making their own decisions rather than entrusting them to city whizz kids in Canary Wharf playing roulette with their savings. I always say investing in property is a long-term game. When you invest in the property market, you can earn from your investment in two ways. A property increases in value over time, this is known as 'capital growth'. Capital growth, also known as capital appreciation, has been strong in recent times in Aylesbury, but the value of property does go up as well as down just like shares do but the initial purchase price rarely decreases. Rental income is what the tenant pays you - hopefully this will also grow over time. If you divide the annual rent into the value (or purchase price) of the property, this is your yield, or annual return. So, over the last 5 years, an average Aylesbury property has risen by £91,750 (equivalent to £50.27 a day), taking it to a current average value of £364,200. Yields range from 3% a year (with 4% to 5% being a sensible average yield) and can reach double digits’ percentages (although to achieve those sorts of returns, the risks are higher). This demonstrates how the Aylesbury property market has not only provided very strong returns for the average investor over the last five years but, how it has permitted a group of motivated buy to let Aylesbury landlords and investors increase their wealth and/or income. 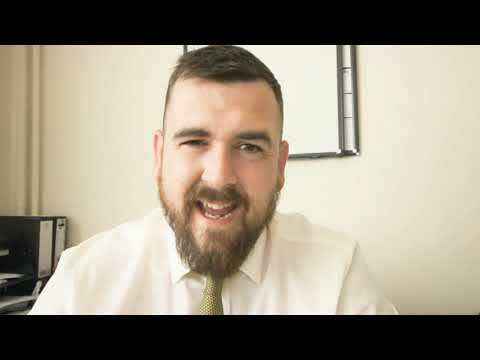 We continue our series of videos regarding the Aylesbury property market. Here we discuss the budget, forthcoming tax changes and the current state of the property market...followed of course by the popular out takes. Please do pop in to see us when you are passing our office in Temple Street , Aylesbury. Remember that if you are not happy with the service you are getting from your current agent changing is easy to do. The Aylesbury housing market has gone through a sea change in the past decades with the Buy-to-Let (B-T-L) sector evolving as a key trend, for both Aylesbury tenants and Aylesbury landlords. and today it stands at 188,700. Currently, the private rented (B-T-L) sector accounts for 16.3% of households in the town. The Government want to assist people living in these properties and help the economy by encouraging the provision of good quality homes, in a housing sector that has grown due to economic forces, pushing home ownership out of the reach of more and more people. Interestingly, when we look at the 1981 figures for homeownership, a different story is told. The significance of a suitable housing policy is vital to ensure suitable economic activity and create a vibrant place people want to live in. With the population of the Aylesbury Vale set to grow to 233,000 by 2037 – it is imperative that Aylesbury Vale District Council and Central Government all work actively together to ensure the residential property market doesn’t hold the area back, by encouraging the building and provision of quality homes for its inhabitants. To do this, the government will invent a distinct affordable housing class for B-T-R, called ‘Affordable Private Rent’, which will oblige new homes builders to provide at least 1 in 5 of a new home development at a 20% discount on open-market rents and three year tenancies for tenants. In return, the new homebuilders will get better planning assurances. Private landlords will not be expected to offer discounts, nor offer 3-year tenancies – but it is something Aylesbury landlords need to be aware of as there will be greater competition for tenants. Over the last ten years, home ownership has not been a primary goal for young adults as the world has changed. These youngsters expect ‘on demand’ services from click and collect, Amazon and TV with the likes of Netflix. Many Aylesbury youngsters see that renting more than meets their accommodation needs - it combines the freedom from a lifetime of property maintenance and financial obligations, making it an attractive lifestyle option. Private rented housing in Aylesbury and Aylesbury Vale, be it B-T-L or B-T-R, will continue to play a very positive role.